Penny is now 6 months, can you believe it? Where has my little newborn baby gone? I packed away a lot of her tiny pink things the other night and had to fight back the tears. Watching a baby grow really helps you to appreciate how fleeting time is and to never waste it. One moment she can barely open her eyes and the next, she’s sausage rolling across the floor to get to her stuffed giraffe. 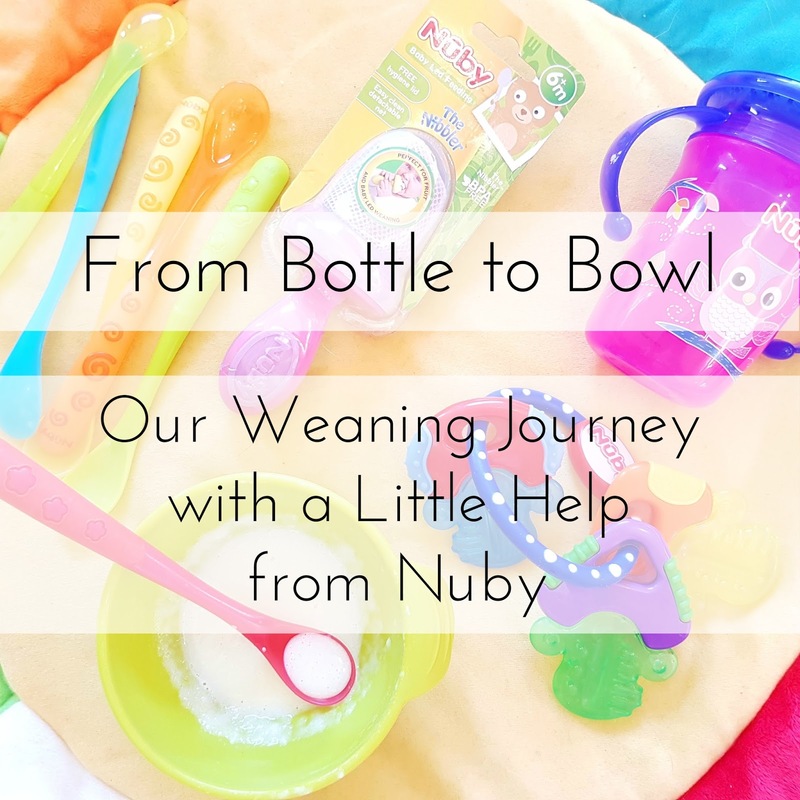 As soon as she hit 6 months everyone became frantic that she wasn’t on solids yet, especially when they knew baby’s of the same age who had started weaning weeks before. With Penny, we are taking things relaxed and pressure-free. I try not to worry too much about her milestones or compare her to other baby’s her age. I’ve met a lot of mums in groups who are completely obsessed with pushing their child and boasting about their achievements. We all know those parents who claim their baby came out the womb tap dancing and speaking a second language, “He’s so advanced for his age!”. Please stop. That’s why I should have added “Is she eating solids yet?” to my list of Things Every New Mum is Sick of Hearing. 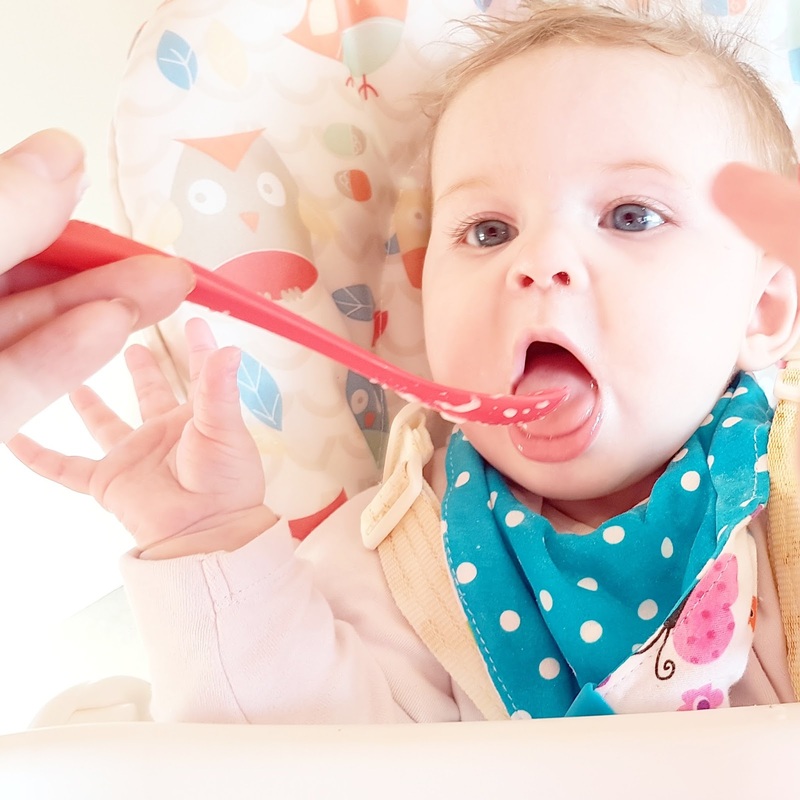 I’ve read a lot about all the different methods of weaning such as the Baby Led route (here is a great video that explains it better than I ever could), ‘5 step plans’ probably cooked-up by baby food brands and different puree diets. I’ve also flicked through my fair share of Annabel Karmel books. Right now, we’re just taking things slow and using a mixture of techniques to work out what works for us a family. 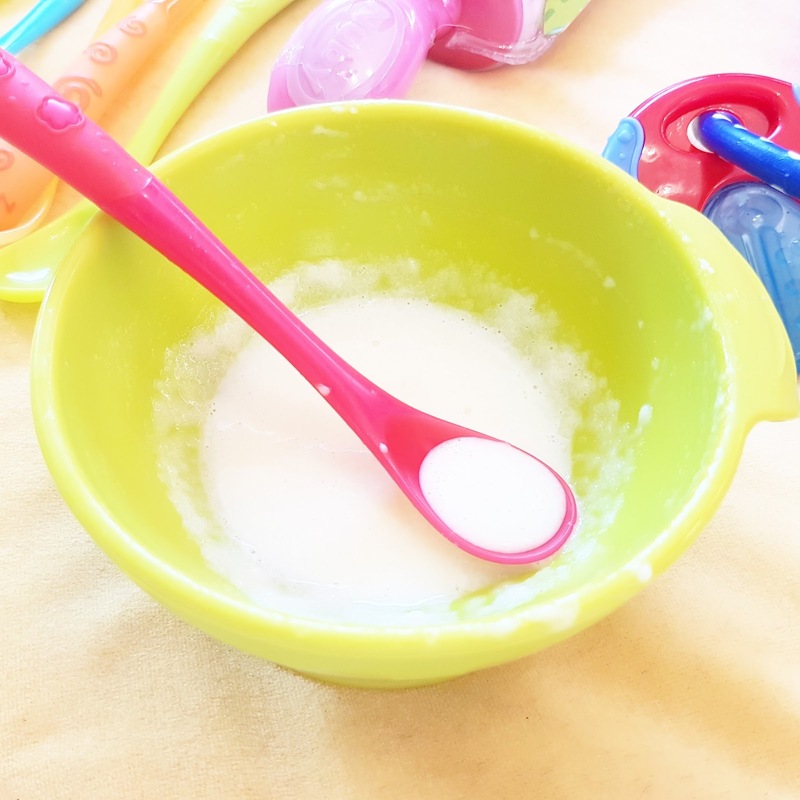 This week we introduced food at lunchtime and she had porridge, apple & pear puree, mashed banana, vegetable soup and a few sachets of flavoured greek yoghurt from Ella’s kitchen, which I all spoon fed her. Penny loved all the new tastes and textures but especially loved sticking her hands in the bowl and dribbling it all down her chin and sucking it off her bib. She was one very sticky baby by the end of it but, hey, that’s what baths are made for right? 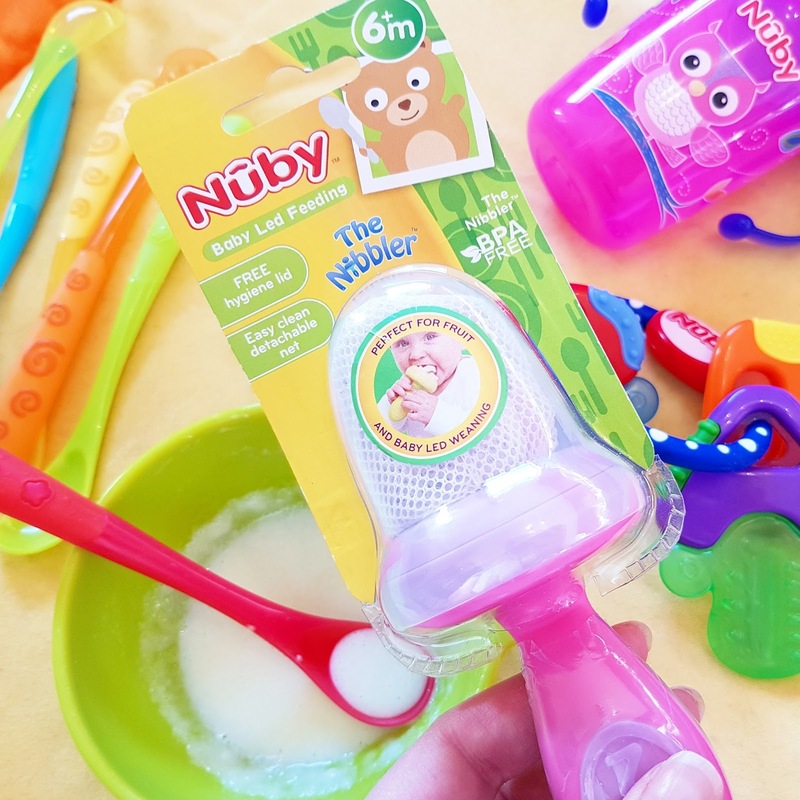 I was kindly sent some goodies from Nuby to make the whole process as easy and as fun as possible which included; Teething Bibs, a 360 No-Spill Cup, a Sure-Grip Suction Bowl and a six pack of long Feeding Spoons that are perfect for getting into jars when we’re travelling. 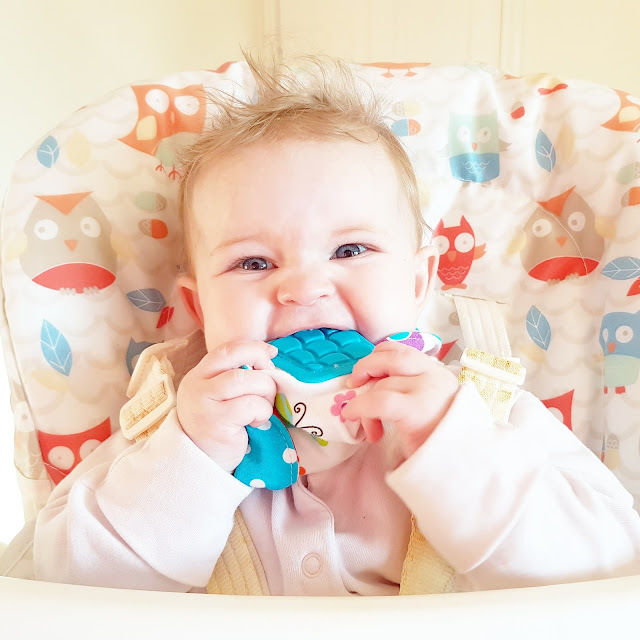 I also received their Icy Bite Teether (teething is a whole other post on its own) and a gadget that I absolutely adore and had never heard of before, The Nibbler. Basically, you can pop fruit and veg into the easy-to-clean detachable net so that the baby can eat whole foods without the risk of choking. It’s perfect for parents who are a little anxious about starting off with large chunks and I love that you can also put ice and frozen fruits inside it for teething babies. I used a lot of these products this week. So far the suction bowl has definitely been my favourite! Even though I’ve been feeding her, those hands have been flapping about like mad and (unfortunately for the dog) this bowl has prevented any spillages or food going projectile. The silicone version is also insulated too which keeps food warmer for longer, which is handy because mealtimes can take a very long time when you are dealing with someone with a mouth the size of a 50p and the attention span of Dory from Finding Nemo. The spoons are also working perfectly for getting food into her tiny mouth. They’re also bright and very comfortable to hold. 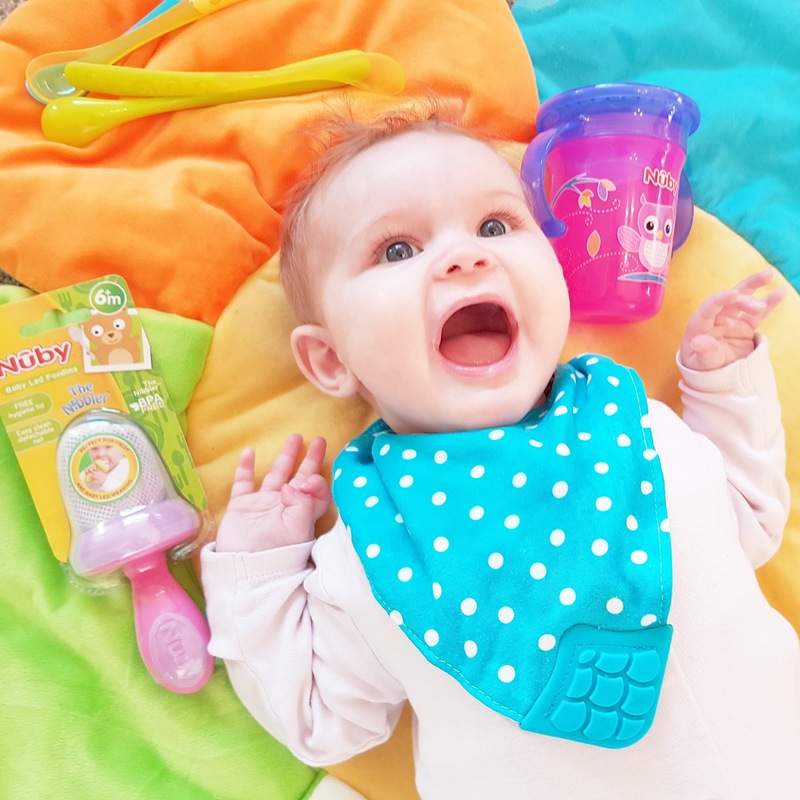 Penny especially loves her teething bibs; they are never out of her mouth! They are reversible, come in a number of different styles and wash without fading which I’ve come to find is a rarity. I am no expert when it comes to weaning that’s for sure (always take your GP or Healthcare Visitors advice) but Penny and I are having fun learning together. Next week we’ll try some new flavours, different textures and perhaps some larger pieces. I think we’ll also let Penny take charge a bit and let the real fun begin! Those bibs are definitely going to come in handy that’s for sure. I also can’t wait to put The Nibbler to the test! Pssst! This post contains gifted items or/and PR samples, however, all opinions are my own (and Penny’s). "How I Gained 25K Followers on Pinterest"